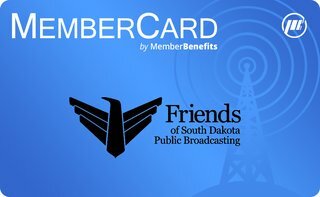 The Friends of SDPB MemberCard is yet another way we have of saying “thank you” to those who support South Dakota Public Broadcasting. It provides great value -- 2-for-1 dining opportunities at restaurants throughout South Dakota and the surrounding states, plus thousands of restaurants nationwide ! Another Great Reason to become of Friends of SDPB Member. . .
Join or renew at the $90 level or higher to receive the Friends of SDPB MemberCard. The MemberCard arrives in the mail with a directory of participating restaurants and discounts at selected on-line merchants. Full instructions about how to use the card can be found in your MemberCard directory. The directory also includes a toll-free number to call for information, including how to use your MemberCard in other participating markets. The Friends of SDPB MemberCard is good for a full year with new restaurants and benefits being added all the time. Visit the MemberCard benefits page for more information. The MemberCard is an additional benefit of membership for those giving $90 or more to support programming on SDPB – both renewed gifts and new memberships. Make the most of your SDPB MemberCard with the all-new MemberCard mobile app for both iPhone and Android, now available in the Apple App Store and Google Play! Simply choose SDPB from the list of MemberCard stations and you’ll be on your way to locating participating restaurants and businesses. You can find out where you can save, no matter where you are, and when you’re ready to redeem your savings, all you have to do is show your smartphone or tablet. No need to keep up with a plastic card - just show and save! Questions? Contact MemberCard by email at CustomerService@membercard.com, or by phone at 800-423-7645.